Lucy is one very lucky young lady. Mum Lynne rang us up a few months ago to discuss a possible party for Lucy’s 10th birthday. As she had never heard of Diva parties before she wanted to come and check us out before she booked. So one Friday morning, Lynne popped round for a coffee with a friend to see what Diva was all about. Thankfully she was very impressed, and reassured that we would be able to host a brilliant party for Lucy. Lynne took on the theme of Diva very seriously! She booked the Mega Diva Party package including the makeover, and added the optional extras of transport in a stretch limousine, and the hot tub! She also provided all the girls with customised glittery t shirts with “Diva” emblazoned on the front! On the day of the party 6 terrifically excited young ladies arrived at Diva HQ in great splendour – we have an arrangement with Daz of Krystal Limousines who ensured the girls were treated – well like Diva’s really! – on their way over to us. On arrival the girls were were shown around the house, and the afternoons party timetable revealed to them. More whoops and screams of excitment then it was time to get their mini makeovers done. Once hair had been curled, nails painted, eyes mascaraed, and nails done it was time for the photo shoot and lots of outfit changes. Every now and then the girls would tear downstairs to grab a quick drink or bite to eat in the party bar, then rush back up for another set of photos. Eventually they decided it was time for the hot tub and there were lots of giggles as they sank into 39 degrees of bubbling water with their champagne glasses full of squash! Whilst they were soaking in the hot tub we were busy making up Lucy’s magazine cover, printing the group photos for each girl and working on the surprise finale. Lynne, dad Ian, Daz and another parent all sat in the party bar with cups of coffee watching the girls through the window – Lynne couldn’t believe how easy this party had been for her! Once the girls got out of the hot tub – they dried off and sat in the party bar finishing off all the food. The surprise finale was greeted with yet more whoops and cheers and then it was time to say good bye. Lots of hugs from the girls and then Daz whisked them off. It was certainly a MEGA diva party!! What an amazing day we had yesterday at Diva Portraits! 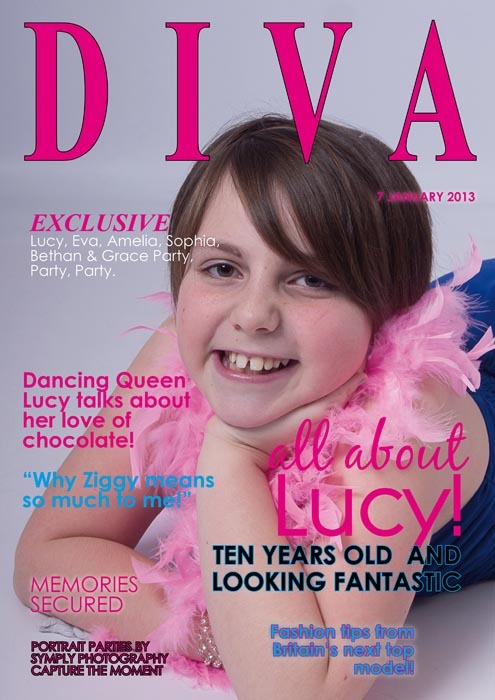 !Yesterday my daughter Lucy had a Diva party, it was absolutely wonderful, the 6 girls loved every minute of it. We opted for the full package and were not disappointed. Sharon put us in touch with Krystal Limousines and we booked a limo get us to the party. The girls faces when the limo arrived were a picture. We arrived at Diva and Sharon explained what the girls were going to be doing and there were lots of squeals of excitement. They changed into the diva dresses and they had their hair and makeup done and the shoot was off. There was lots of giggling and laughing as they posed with props and pouted their way through the shoot. Nipping down throughout to the party room to snack and drink (non- alcoholic of course) and turn the music up, to return to the studio for a quick outfit change and more posing. Then after the shoot it was a dip in the hot tub to chill, again, more giggling and laughing. Then to finish the day a showing of their photos in a slide show on the big screen and a presentation of their shots to take home. 6 very hyper girls jumped into the limo for our return journey. I don’t think i have ever had a party that has been so easy to organise, all the stress that is normally involved was taken away by Sharon which was fantastic especially straight after Christmas. Her and her husband Kevin welcome her party guests into their home and you instantly feel welcome. Sharon was excellent at bringing out the inner Diva in all the girls whilst Kevin put together the pictures and the slide show for the finale. © 2019 Diva Portrait Parties Epinguet De Burton Close Billingborough Lincs NG34 0PY -Tel: 01529 241633 |ProPhoto theme by NetRivet, Inc.